More tourists visit the Northern Circuit than most other parts of the country, and with good reason. The sprawling landscapes, numerous varieties of wildlife, and fascinating cultures are facets of the Northern Circuit of Tanzania. Drier climate and rocky terrain accompany lower elevations, while misty highlands and cool air complement unusual foliage and forest dwellers. Ease of travel throughout the region is generally determined by weather conditions. Rain makes most roads slick and slow. The dry season is the most suitable time for smooth travel, dust being the only impediment. Game viewing is at its optimum in the Ngorongoro Crater and on the Serengeti Plains. The largest animal migration in the world, that of the white–bearded wildebeest, begins and ends here at various times of the year, and the alkaline lakes shimmer pink with the presence of millions of flamingos. The park has the three distinct zones: Ngurdoto crater (often described as a mini-Ngorongoro), the Momella Lakes, a group of shallow alkaline lakes fed by underground stream, and Mount Meru, one of the most rewarding mountains to climb in Africa. Animals here include buffalo, elephants, hippos, giraffes, zebras, a variety of antelope, blue monkeys, black and white colobus monkeys, leopards and hyenas. It is a good one-day game drive. Hemingway describes Lake Manyara National Park’s magnificent hunting country in “The Green Hills of Africa”. Mahogany, sausage, and croton trees abound, along with blue and vervet monkeys. Elephants feed off of fallen fruit, while bushbuck, waterbuck, baboons, aardvarks, civets, shy pangolins and leopards all make their home in the forest. Manyara is sanctuary to elusive buffalo, hippos, giraffes, impalas, zebras and its most famous resident — tree climbing lions. Lake Manyara itself is a magnet for numerous birds, and a kaleidoscope of different species can be found around its shores, including large flocks of flamingos. The park is ideal for a day trip. A four–wheel drive vehicle is recommended during the rainy season. The dry season runs from June to September and January to February. The Ngorongoro Conservation Area is a huge area containing active volcanoes, mountains, archaeological sites, rolling plains, forests, lakes, dunes, and of course the Ngorongoro Crater and Olduvai Gorge. The views at the rim of Ngorongoro Crater are sensational. On the crater floor, grassland blends with swamps, lakes, rivers, woodlands and mountains. The crater is a paradise for wildlife: it has the densest predator population in Africa and is home to up to 25,000 large mammals, mainly grazers such as gazelles, buffalos, eland, hartebeest and warthogs. You will not find any giraffes or topis, as there is not much to eat at tree level, and because the competition with wildebeest is so fierce, impalas are are also absent. The crater elephants are, strangely, mainly bulls. A small number of black rhinos are here. The bird life is largely seasonal and is also affected by the ratio of soda to fresh water in Lake Magadi on the crater floor. In the northern, remote area of the Ngorongoro Conservation Area, you will find Olmoti and Empakaai Craters, Lake Natron and Oldoinyo Lengai or ” Mountain of God”, as named by the Maasai. Lake Natron is the only known breeding ground for East Africa’s flamingos. The ruins of a terraced stone city and complex irrigation system lie on the eastern side of Empakaai, known as the Engaruka Ruins. Their origins are a mystery, as there is no tradition of stone building in that part of Africa. Located just north of Olduvai is a fascinating natural phenomenon, a barchan (crescent-shaped) dune known as the “Shifting Sand”. It is composed of ash, blown west after one of Ol Donyo Lengai’s eruptions roughly 30,000 years ago. There are several other dunes created in the same manner, although they are further away and not as large. The Shifting Sand is 100m long and 9m high (109yds, 30ft). Its unique location, set as it is the grassland plains, and its continual westward movement, make it an interesting stop on your safari. The dune moves only during the dry season, covering an average of 17m (18yds) per year, as indicated by concrete markers first set up in 1969. The dune is formed by the westward wind, which continuously blows the sand up the windward side, forcing it to crest over the peak and tumble down the leeward side. Many granules roll to the sides of the dune, forming the tight curves. The wind swirling around the dune aids in keeping its shape as it slowly moves across the open savanna. The Maasai people believe the shifting sand is sacred. Maasai women perform ceremonial dances there to ensure fertility, plentiful rainfall, and good health for their children. The name “Olduvai” is a mispronunciation of the Maasai word “Oldupai”, for the wild sisal (Sansevieria ehrenbergiana), a plant that is common throughout that area. A 50km (31m) stretch that is sometimes 90m (295ft) deep, this gorge cut in the earth reveals distinct layers of rock harboring a wealth of historical information. Three and a half million years ago, Sadiman Mountain, to the west of Ngorongoro Crater, puffed and spewed out masses of grey ash, covering a good portion of the plains. Subsequent rain settled the ash, which in turn played a natural record-keeping role by preserving the animal spoors that existed at the time. Some of the animals that roamed the plains then were very different from what they are today. For example, there are traces left by the hipparion,a horse-like animal with three toes. However, similar modern-day species also existed then, as records show that giraffe and guinea fowl were plentiful. Through the discoveries at Laetoli site to the south of Olduvai, by world–renowned archaeologist/paleontologist Mary Leakey in 1976 and 1978, we know that at least three hominids also walked across the plains. Known today as Australopithecus Afarensis, they probably resembled ape more than man. The height of this early ancestor was believed to average 1.5m (5ft), while its brain, measured in cubic centimeters, was small, at only 400cc; today, man’s brain average 1400cc. However, the fact remains that this ancient hominid walked on two legs, leaving his hands free, possibly to carry tools or weapons and to hunt and defend himself. The Serengeti is one of the world’s last great wildlife refuges. This vast area of land supports the greatest remaining concentration of plains game in Africa, on a scale unparalleled anywhere else in the world. 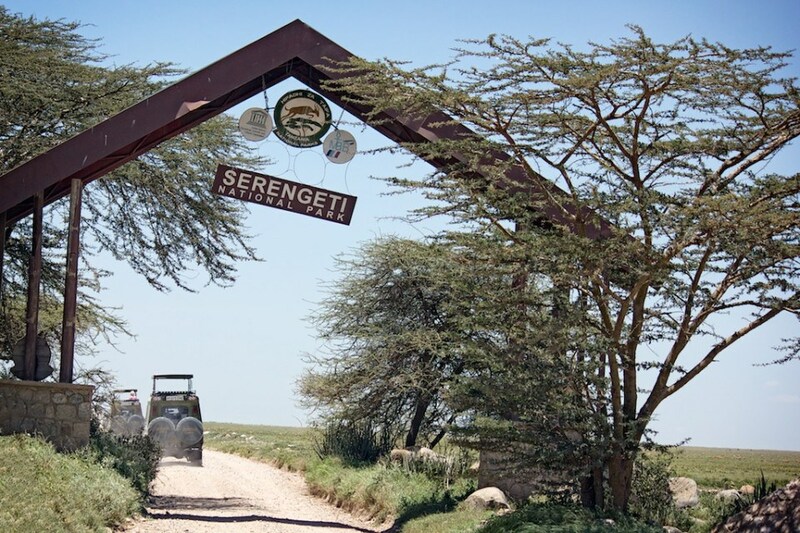 The name comes from the Maasai “Siringet”, meaning endless plains. Equal in size to northern Ireland, the park contains an estimated three million large animals, most of which take part in a seasonal migration that is one of nature’s wonders. The annual migration of more than 1.5 million wildebeests, as well as hundreds of thousands of zebras and gazelles, is triggered by the rains. The wet season starts in November and lasts until about May. Generally, the herds congregate and move out at the end of May. Their movement is a continual search for grass and water– the moving mass of animals requiring over 4000 tons of grass each day. The exodus coincides with the breeding season, which causes fights among the males. As the dry season sets in, the herds drift out of the west, one group to the north, the other north-east, heading for the permanent waters of the northern rivers and the Mara. The migration instinct is so strong that animals die in the rivers as they dive from the banks into the raging waters, to be dispatched by crocodiles. The survivors concentrate in Kenya’s Masai Mara National Reserve until the grazing there is exhausted, at which time they turn south along the eastern and final stage of the migration route. Before the main exodus, the herds form a spectacular sight, massed in huge numbers, with the weak and crippled at the tail end of the procession, followed by patient, vigilant predators. Tarangire lies to the south of the large open grass plains of southern Maasai-land. The features of Tarangire which correlate with the type of animals residing in the area are grass lands and flood plains. Tarangire is famous for its tree-climbing pythons, as well as zebras, hartebeest, elephants, buffaloes, waterbucks, gazelles, oryx and abundant bird life. In Tarangire a prominent indigenous tree is the baobab (Adansonia digtata). Distinct in appearance and believed to survive for several centuries, some of these quiet giants have been shown by recent carbon dating to be close to 3000 years old. Usually found growing in low–lying arid and semi-arid regions, the baobab stands tall and robust, with a trunk circumference of up to 10m (33ft). The tree’s stubby, unruly branches give it an air of having been uprooted and deposited head-first in the soil. Its branches are bereft of leaves most of the year. While the tree’s white blossoms are lovely to look at, they carry a most unpleasant scent. Practically every part of the baobab can be consumed, and is used by both man and beast. Leaves, fruit, flowers, seeds and roots are all used for medicinal purposes, particularity for fever and vitamin C deficiencies. The baobab’s hollow trunk is used by hornbills as a nesting rook, by the locals to bury their dead, and even as a water reservoir. Some trees have been known to have a capacity of 140,000 liters (30,800 gal)! The baobab’s wood is spongy and so is clearly not suitable for building material, firewood, or charcoal. However, its fibrous bark has a multitude of uses, from ropes, mats and cloth to the creation of musical instruments. The baobab is an extremely adaptable tree, and is able even to survive fires. Once its outer skin has been stripped away, it is capable of — left to recover undisturbed — regenerating new bark. These attributes help to prolong the life of the amazing baobab, despite both man-made and natural adversities.